This is going to hurt! In a world where costumed heroes soar through the sky and masked vigilantes prowl the night, someone's got to make sure the "supes" don't get out of line. And someone will! 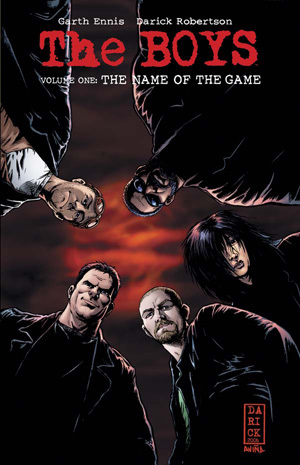 Billy Butcher, Wee Hughie, Mother's Milk, The Frenchman, and The Female are The Boys: A CIA-backed team of very dangerous people, each one dedicated to the struggle against the most dangerous force on Earth - superpower! Some superheores have to be watched. Some have to be controlled. And some of them - sometimes - need to be taken out of the picture. That's when you call in The Boys! J has been hounding me to read this series for a very very long time! He swore I would love it, but I kept getting distracted by library books, fairy tales, and zombies. I finally picked it up and started reading yesterday. And he was right (but don't tell him), I loved it! The Boys blends the classic comic book superheroes with the complicated world of things like Watchman. We see how the supes act once the final panel has been drawn. They aren't the boy scouts we often see. Instead, they are real people with real issues. And in some cases, not so real issues, but definitely weird. The Boys are there to protect us nonsupes from the collateral damage of fighting crime. I loved Hughie's innocence (that opening page is a killer! ), MM's father status, Butcher's mysterious agenda, and Frenchman and The Females shrouded past. I can't wait to learn more about these characters.